Joe Ziobro (pronounced “Zee’ bro”) was born January 2, 1902 at Minneapolis, Minnesota, the youngest of three children born to Francisok “Frank” Ziobro (1860-1916), and his wife, Salomena “Selma” (Moskalik) Ziobro (1871-1912). Joe’s sister was Mary Lucy Ziobro (1896-1972), who married Stanley John Skay and they lived most of their lives in the Minneapolis area. Joe’s brother was Francis Vincent “Frank” Ziobro (1900-1968). who lived in the Washington, D.C. area before relocating to Alameda, California. Joe’s parents had been born in Austria and immigrated to America in 1891 so Polish was the language spoken in the Ziobro home while Joe and his siblings were growing up in Minneapolis. Joe was a ward of the court by the age of 11 and an orphan by the age of 14, so Mrs. Elizabeth (Gerck) Kiedrowski (1875-1965) was appointed legal guardian for him and his siblings. As he grew older, Joe tried his hand at being an artist but he soon learned that, if he was not going to be a starving artist, he would have to find another means by which to support himself. Ziobro would later claim that he got his start in the auto racing promotion business around 1923. We do know that, by 1926, he had landed a job as an “advanced advertising man” with the International Motor Contest Association (I.M.C.A.) that was then headquartered in his hometown of Minneapolis, Minnesota. It was his job to travel to cities and towns in the Midwest where I.M.C.A. had scheduled auto races. He would arrive a week, or two, before a scheduled race meet and setup the outdoor advertising before the event. By the time race day rolled around, he had already moved on to the next town where I.M.C.A. sanctioned races were scheduled to be run. October 18, 1926 at the ½ mile dirt oval Mississippi State Fairgrounds in Jackson, Mississippi – Sanctioned by I.M.C.A. Feature race winner: Emory Collins of Regina, Saskatchewan, Canada in his Yale special. October 26, 1926 at the ½ mile oiled dirt oval Cotton Palace Fairgrounds in Waco, Texas – Sanctioned by I.M.C.A. October 28, 1926 at the ½ mile oiled dirt oval Cotton Palace Fairgrounds in Waco, Texas – Sanctioned by I.M.C.A. Joe Ziobro moved to Wichita, Kansas in the early 1930s and soon formed an alliance with another promoter / theatrical agent there named William Fred Floto (1884-1948). Floto was a much younger brother of Otto C. Floto (1863-1929), the well-known Denver sports writer who lent his name to his employer, the Denver Post, to put on their famous Sells-Floto traveling circus. William Floto had been an agent for Buffalo Bill Cody’s Wild West Show of Denver, Colorado and for the Miller Brothers’ 101 Ranch Wild West Show of Lamont, Oklahoma before moving to Wichita from Tulsa, Oklahoma, with his wife in 1924. Floto became a Studebaker dealer in Wichita until he received an offer to be the public relations director for the Sells-Floto circus. Floto served in that capacity from 1927 until 1930 when he returned to Wichita and formed the alliance with Ziobro. William Floto was the promoter of record of these races while Ziobro was named as one of Floto’s “associates” in the venture. Rookie driver, Charles E. Hamilton (1910-1935) of Topeka, Kansas, received fatal injuries when he crashed his Big Car in the south turn during time trials on July 27, 1935 at the Cowley County Fairgrounds in Winfield, Kansas and he passed away several days later. This was the first of two fatalities known to have occur at an auto race promoted by Ziobro during his 33-year career of promoting such events. Joe Ziobro is shown here dressed all in white and standing in the middle of Fair Park Track at the Old Oklahoma State Fairgrounds on Eastern Avenue in Oklahoma City on June 5, 1937. He was the race promoter that day and was doubling as the flagman and official starter as well. He was dressed all in white in an attempt be easily seen through the dust by the drivers. Feature race winner: Results of these races have yet to be located. Feature race winner: The official reason that these races were canceled was that the racetrack was too muddy to race on. A lack of participants may well have had something to do with that decision though. Joe Ziobro relocated from Wichita, Kansas to Oklahoma City, or “where ever I hang my hat” and continued to promote auto races. Type of cars: Midgets – These were the first scheduled midget races ever run at Oklahoma City. July 3, 1938 at the 5/8 mile-high-banked dirt oval Haskell Speedway at Haskell, Texas – Sanctioned by S.R.A. Joe Termin became the second person to be fatally injured in a racing program promoted by Joe Ziobro. His car threw a right rear tire on the third lap of the first heat race on July 4, 1938. The car then tumbled down a steep embankment and crashed through a high board fence. 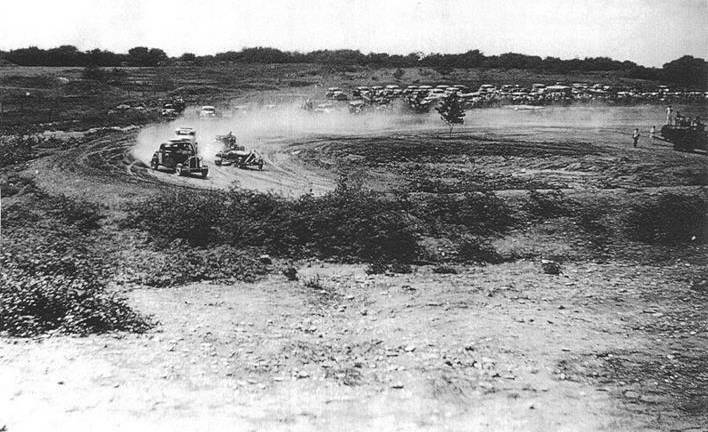 July 4, 1938 at the 5/8 mile-high-banked dirt oval Haskell Speedway at Haskell, Texas – Sanctioned by S.R.A. Ziobro moved from Oklahoma City to Ft. Worth, Texas to begin regularly promoting midget races at Sportsman’s Park in his new hometown. Feature race winner: These races were canceled due to rain. After the races in September, 1940, Ziobro turned the lease to Sportsman’s Park over to Les Butler, Sr. of Dallas, Texas and announced that he was going to Mexico City to host races there. By spring, Ziobro had returned to Texas. Feature race winner: Ziobro announced that there would be no more racing at the Fair Park Speedway this year as the Texas State Fair officials had said that the racetrack was not available. Regardless of Ziobro’s announcement, the Texas State Fair Association contracted with Henry Watson to hold races at the Fair Park Speedway in 1941 and the association then hired Ziobro to be the track manager. The federal government decreed that all auto racing had to cease in the United States by July 31, 1942 and such racing could not resume for the duration of World War II. Ziobro took advantage in the lull in racing activity by returning to Minneapolis, Minnesota where he joined the United States Army, rising to the rank of Technical Sargent before he was discharged at the end of the war. Ziobro had returned to Oklahoma City by 1946 but the local racing scene had changed since the war. The father and son team of Ray and Oral D. Lavely of Houston, Texas were making arrangements to promote races as Lavely Racing Promotions beginning in July, 1946 at Taft Stadium in Oklahoma City so Ziobro moved to Waco, Texas. 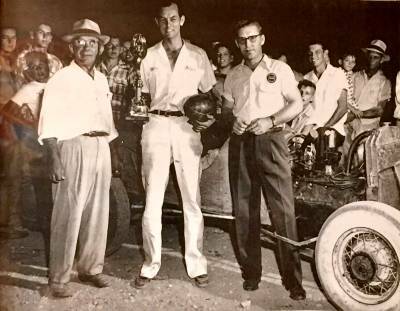 There, he leased an old gravel quarry on the south side of Waco from Mary Sickenburger and built a new 1/3 mile dirt oval racetrack that he named the ‘Suicide Bowl.” He began promoting races there on May 26, 1946. Electronic public-address systems were coming into use after World War II, so Ziobro hired Swede Lawson to be the flagman / starter of the events he promoted while Ziobro, himself, moved to the judge’s stand to announce the races. Feature race winner: These scheduled races were canceled by the promoter for an unknown reason. Ziobro subleased the Suicide Bowl after the races there on July 14, 1946. When the facility opened again for midget and stock car races on August 4, 1946, Chick Stewart was the new promoter and R. L. Flanagan was the track manager. The racetrack was paved by October of 1946 in an effort to keep the dust down, but it was not long before Ziobro got his lease back and it was a dirt racetrack again. Feature race winner: These races were canceled due to the racetrack being too muddy. Feature race winner: Buddy Rackley of Austin, Texas. When Joe Ziobro received word of the passing of William F. Floto in Wichita, he immediately announced to the press that, due to a death in his family, he would not be promoting any more auto races in Waco as he had to move back “to Wichita, Kansas to carry on business there.” He then turned the rest of the races he had scheduled in Waco, over to an experienced racing promoter, Kenneth Niles, of Dallas, Texas. Feature Race winner: This was to be opening day at the Suicide Bowl but these races were canceled due to too few paying spectators. Feature race winner: Horace Ritchie of Waco, Texas. 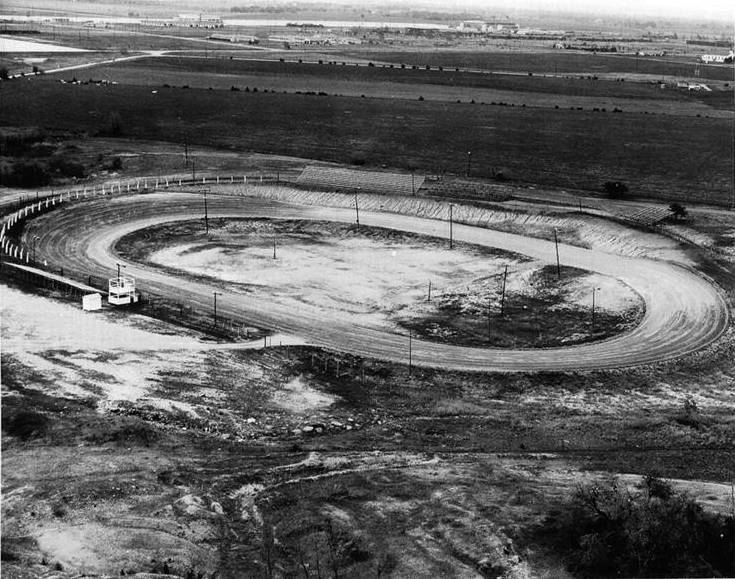 The new Gravel Bowl speedway opened about 38 miles away, between Temple and Belton, Texas and the promoter there scheduled races on Sunday afternoons at the same time that Ziobro was putting on his races at the Sucide Bowl, so Ziobro discontinued his weekly races until lights could be installed and the races moved to Sunday nights. Feature race winner: These races were canceled after only four midgets showed up to race. Feature race winner: Frank Matthews of Dallas, Texas. Feature race winner: Slim Sullivan of McGregor, Texas. Feature race winner: These were the mid-season championship races and twin feature races were run. J. T. Shackley of Dallas, Texas won the first feature race while Johnny Etheridge of Corsicana, Texas won the second feature race. B. B. Thompson of Gatesville, Texas was crowned the mid-season champion. Feature race winner: Results of these races have yet to be located except that one woman received several broken fingers when she was struck by the errant wheel from a racing car. Robert Owen of Corsicana, Texas became the official starter / flagman for the 1951 racing season. He may have held that position with Ziobro in 1950 as well but that is uncertain at the present time. Left to right: Joe Ziobro, Gordon Woolley and Wynn’s representative Woody Wadzeck during a trophy presentation at the Suicide Bowl at Waco, Texas in 1951. Starter / flagman Robert Owen, of Corsicana, Texas was injured when he was struck by a car during the races at the Suicide Bowl on Sunday night, July 22, 1951. He spent the night in the hospital having suffered cuts and bruises, but no serious injuries, in the accident. Ziobro suspended the racing at the Suicide Bowl after Owens’ accident and did not resume the programs until September 23, 1951 when he scheduled midget racing at the Suicide Bowl. 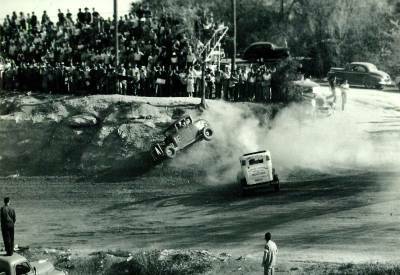 September 23, 1951 at the 1/3 mile dirt oval Suicide Bowl at Waco, Texas – Sanctioned by S.M.R.A. Feature race winner: Results of these races have yet to be located but it is known that few midgets entered these races. Things had not been going well professionally for Ziobro in 1951. A spectator had been critically injured during the opening day races of the season when he was struck by an errant wheel from one of the race cars. Race car count, and with that, spectator turnout, had been disappointing all season. Ziobro had one more program already on the schedule in 1951. “Joie Chitwood’s Auto Daredevils” appeared at the Suicide Bowl on September 28, 1951. At the conclusion of that program, Ziobro closed the racetrack. That December, George Larsen of Waco, who had been a regular driver at the Suicide Bowl, was fatally injured in a stock car race at the Gravel Bowl speedway near Temple, Texas. Disillusioned and in debt, Ziobro subleased the Suicide Bowl to Jess Radle & Son during the winter of 1951 - 1952. The deal called for Ziobro and Johnny Jank to assist the new promotional team for the 1952 racing season to help the transition go smoothly. Bob Walker, a personality on local KWTX radio, assumed the public address announcing duties from Ziobro for the new promoter. Jess Radle attended the 1952 Indianapolis “500” leaving the organization and promotion of the upcoming races in the capable hands of Johnny Jank and Joe Ziobro. Feature race winner: Billy Jack Cosper a.k.a. “Billy Jack Casper” of Waco, Texas. Bob Hayes took over the public address announcing duties at the Suicide Bowl beginning of the 1953 racing season. Ziobro continued to work for Jess Radle & Son at the Suicide Bowl for 1953 and 1954. During that time, his duties included the weekly racetrack preparation. Ziobro got the Suicide Bowl back from Radle, shortened the racetrack to ¼ mile so that it was the same size as other racetracks in the area, resumed his position as race promoter before opening day of the 1955 racing season and named Gene McCracken as the track’s official technical advisor. He then adopted rules for the competing cars that conformed with the Dallas, Ft. Worth and Waco Racing Association (D.F.W.R.A.) so that competitors could race at the Suicide Bowl and a number of other area racetracks without having to make changes to their cars. 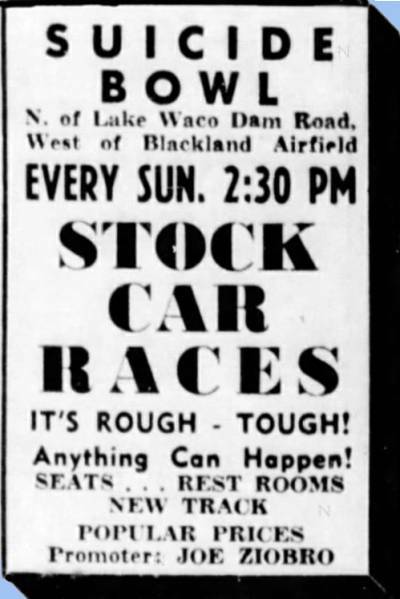 Feature race winner: Either Ray Rowden or Billy McKelvey, both of Ft. Worth, Texas, but the “Waco News-Tribune” story was not clear on this point. Feature race winner: Dan Melton of Dallas, Texas. Feature race winner: Don Melton of Dallas, Texas. Feature race winner: Jim Crocker of Dallas, Texas. Jim McElreath of Ft. Worth, Texas won the trophy dash and finished second in the feature race while Gordon Woolley won the first heat race, the third heat race, the Australian pursuit and the feature race. Today, the site of the former Suicide Bowl is covered by the waters of Lake Waco. In 1958, Ziobro purchased just over 2½ acres of land at 1209 Loop Drive on the Dallas Highway in Waco from the City of Waco for $150 and opened “Joe’s Mobile Home Sales” where he engaged in the business of buying and selling used mobile homes. Ziobro lived in one of the homes at the rear of the lot. Around 4 a.m. on August 28, 1969, a local police officer was making his nightly rounds when he noticed the door standing open to Ziobro’s residence. Upon checking further, he found Ziobro’s body inside. John Cabaniss, a local Justice of the Peace, signed an official ruling that Ziobro had died from natural causes at 12:01 a.m. that same morning. It is unknown if Joe Ziobro was ever married and the only surviving relative mentioned in his obituary, was his sister, Mrs. Mary Skay of Minneapolis, Minnesota. J. A. Lipscomb, Jr. was named the administrator of Ziobro’s estate and he is buried in Oakwood Cemetery at Waco.